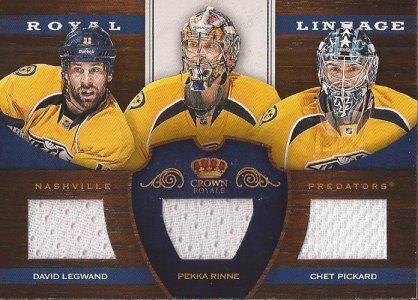 2 by 3 Heroes: Let's do a box break. It's been a while since I have ripped a box and showed off the contents. My LCS has been having some previews of Black Friday for the past few weeks with reduced prices on specific boxes. 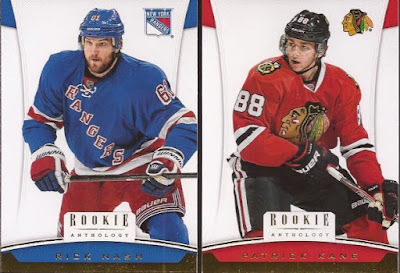 Yesterday, hockey got it's day in the sun with the product of 2012-13 Panini Rookie Anthology for $39 a box. That is pretty hard to pass up. It's just under the price a Dave & Adams, and no shipping charges. While that year doesn't have the incredible rookie class of the following year's release, the hits available are nothing to avoid. Good pulls can be had. Ten packs in a box, 5 cards in a pack, and you are going to get one auto, one relic and then two more hits (either/or). So four guaranteed hits, it was worth the risk. I would say when all was said and ripped, I did ok. While the hits we not all monsters, one for sure is really nice. Let's just show off some scans. Just in case you were wondering, this is the base design. Gold foil, and too much of it with the player name, the logo and that silly bar at the bottom. Otherwise, it's pretty clean and focuses on the player. Though, centering the player's face tends to make the card off balanced. Card manufacturers don't get art. Six total inserts in the box. Here are three from three different sets, even though they look a lot alike. 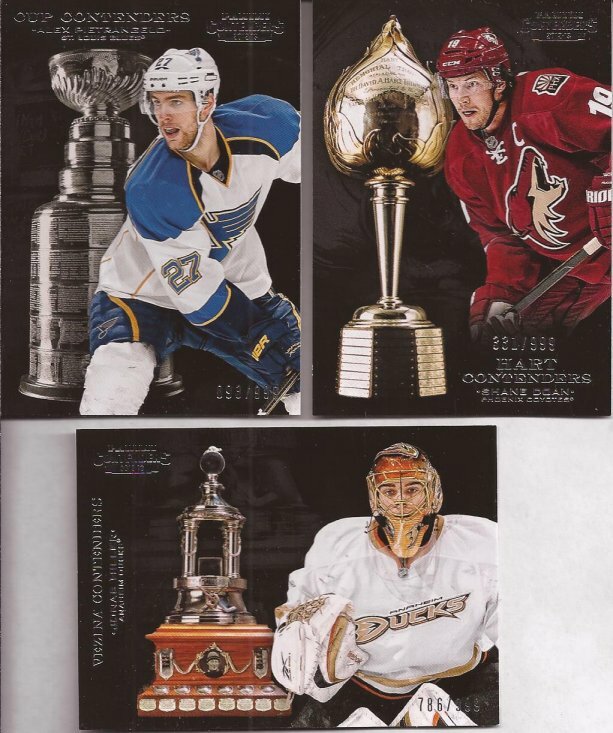 Cup Contenders in the upper left, Hart Contenders on the upper right, and Vezina Contenders at the bottom. Let's be honest - only Hillar might win the Vezina out of this group. I will give credit that the Blues are coming out of the gate hot this season. Their problem is they always crap the bed when the post season comes. Three more. 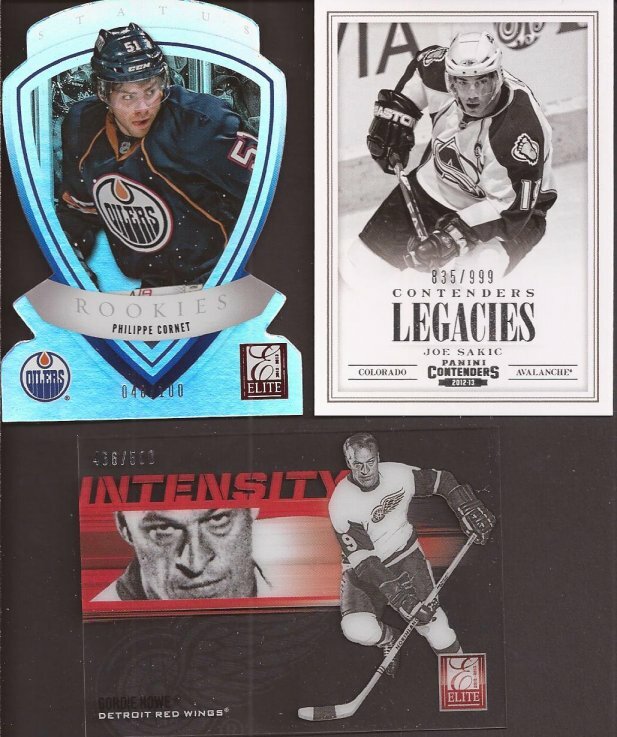 That Oiler rookie card of Cornet is all foily. And it's pretty lame as Cornet has all of 2 games of NHL experience and is currently playing in Norway. Sakic is not too bad. That Howe is a acetate card and looks nice in hand, though it's kind of thin. Alright, let's get to the hits. Along with the 10 packs, you get a 3 card pack of Prizm. I beat the odds and pulled a refractor auto of Greening. 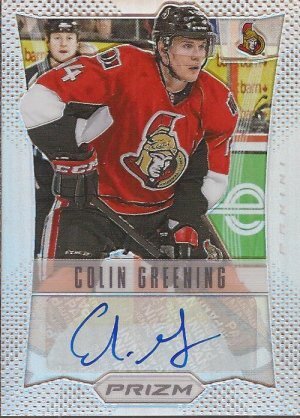 This is actually the 2nd autograph of Colin I have pulled from hockey products. And like the first one, this is heading north of the border. BTW - hits in the bonus Prizm packs do not count against the hits in the box. SCORE! 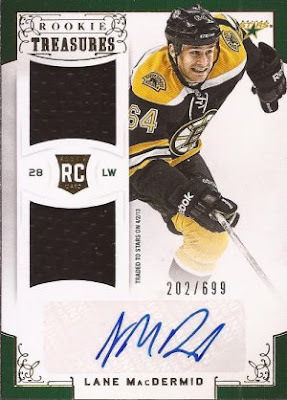 I would call this the guaranteed auto from the box. Not that great, as Elliott is now with the Yotes and just an average defender. And Bronze is the lowest level of autographs in the product. It does seem that one of the other two hits in the box tends to be a auto/relic. I have ripped 4 or 5 boxes and always pull a Rookie Treasures card. Maybe my luck. Lane MacDermid is now a retired brawler, saying he just lost his desire to play the sport. He played a grand total of 21 games. 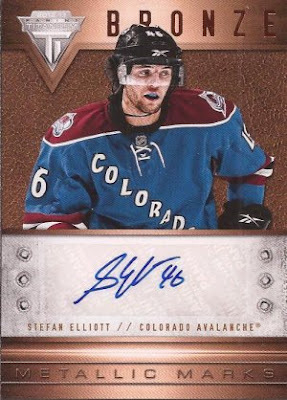 I should just collect Leighton, as I think this makes the 4th hit of his I have ever pulled. 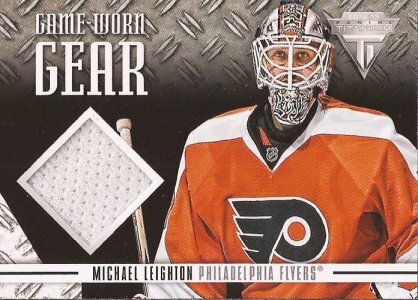 Boring, boring white swatch, and considering Leighton's career, you can't even be sure it's a Flyer jersey. Though, I like to think this is from the sweater on his back when Kane slipped the OT Cup winning goal under his pads in 2010. Alright, more boring white swatches, but you have two decent players on this card. Not so fast, there, Pickard. Well, there you go - my four hits, plus a bonus autograph. Actually, I'm not done. This box was LOADED with hits. In the 11 packs within, I pulled 7 hits. Yes - SEVEN. So let's show off two more cards. 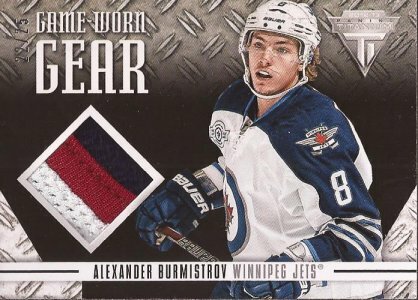 Another in the line of blah players, as Burminstrov isn't lighting up the league in Winnipeg. At least he is still in the NHL, and this is a heck of a nice three color swatch from his sweater. It's also numbered 22/25, so it's fairly low in the run. I may throw it on Ebay just to see what kind of interest it brings. I cannot complain about this, being the big hit of the box. A great stick relic of HOFer Bobby Clarke - a sweet section of the stick showing the Canadian maple leaf. When you think about all the damage Clarke did with his stick, one can only imagine what this relic saw. 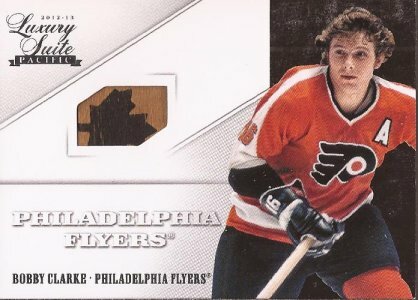 As great as Clarke was, he was a bit of a wuss, knowing he could be a dirty player with the Flyers (and his lumber) and have his back covered by Dave Schultz, Don Saleski, Bob Kelly, Andre Dupont and any number of others on the roster. Still, you cannot ignore his skills of putting the biscuit in the basket and is deserving of his status in NHL history. There you have it. It was a fun rip. If I could get relics or autos in 63% of the packs in a box for $39, I wouldn't hesitate to buy it. Besides the Clarke staying here and the Greening already with a destination, talk to me if you are interested in any of the other hits. Nice break, the MacDermid and Clarke cards are awesome! BTW, sent you a package on Friday but think I forgot to put a note in it. When you see the yellow bubble mailer from RI that's me!